Framlingham is a rural district and village in western Victoria, 25 km north-east of Warrnambool. In addition to the farmlands there are the Framlingham Aboriginal Reserve and Forest to which the Aboriginal community secured freehold titles in 1971 and 1987. The second title came 126 years after a mission station was established there. White settlement of the Framlingham district first occurred about 1840 and the village began with the Brefnay Hotel in about 1848. A store was opened during the next decade and a Presbyterian church was built in 1870. Settlement picked up during the 1870s and a school was opened in 1872. Farming involved a considerable amount of tree clearing, but grazing and dairying were successfully taken up. 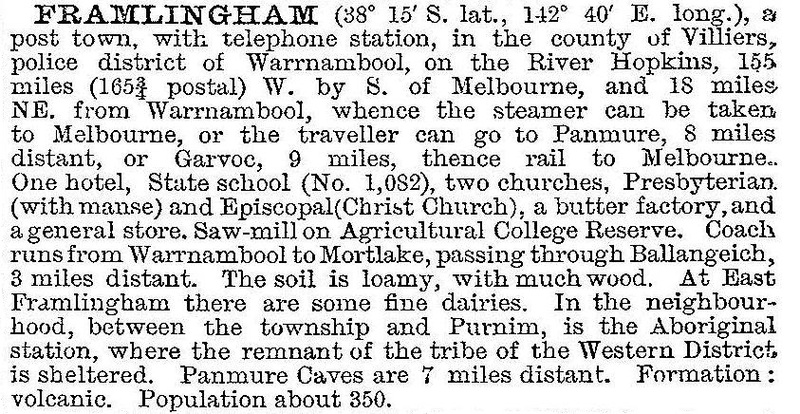 When there was a census population of as few as ten people, the Warrnambool Anglican church obtained a reservation of 1416 ha for an Aboriginal mission to ‘ameliorate the present wretched conditions of the Aborigines’. The reservation adjoined the north bank of the Hopkins River west of the village. In 1890 the reserve was reduced by about five-sixths, the Aboriginal community only keeping an area by a persistent refusal to move elsewhere. After World War I the store and the sawmill were closed, and the hotel licence was surrendered in 1934. During this period there were very few Aborigines authorised to occupy the Framlingham reserve, but up to 70 lived there in defiance of the law and in considerable poverty. They and their descendents formed the group which successfully agitated during the 1980s for vesting of the Framlingham forest in an Aboriginal community group. Framlingham has a public reserve and a hall. The school was closed in 1993. The census in 1961 included 72 Aboriginal people. The census in 2011 included 36 Aboriginal people.